Learn how to create the illusion of sunlight shining through trees with Photoshop. Then, finish off the effect by making it look like the sunbeams are shining on the ground below the trees! This "sunlight through trees" effect can be a great way to enhance an outdoor photo. And as we'll see, creating it is a lot easier than you might think. 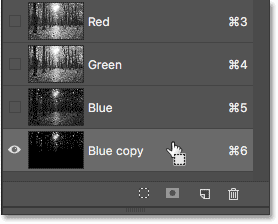 We'll start by using Photoshop's color channels to help us select the sky behind the trees. Then, we'll use the Radial Blur filter to turn our selection into rays of sunlight. We'll brighten the sunlight using an Outer Glow layer style and then blend our sunbeams in with the image using the Soft Light blend mode. 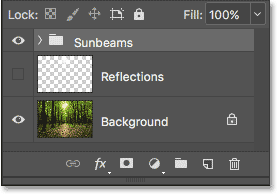 To lengthen the sunbeams, we'll use Photoshop's Free Transform command, and we'll soften them using the Gaussian Blur filter. 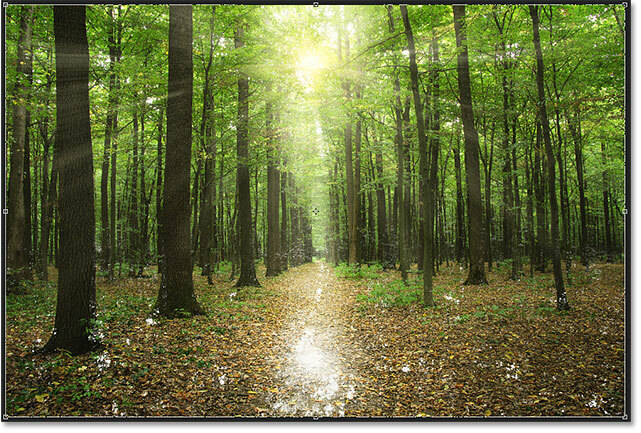 When we're done, we'll use a layer mask to hide the sunbeams in areas where we don't need them. 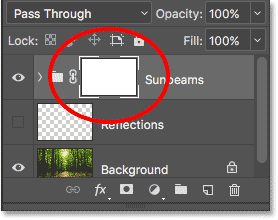 There's quite a few steps involved in creating this effect, but as always, we'll take it one step at a time, explaining things as we go, so that even if you're new to Photoshop, you can easily follow along. 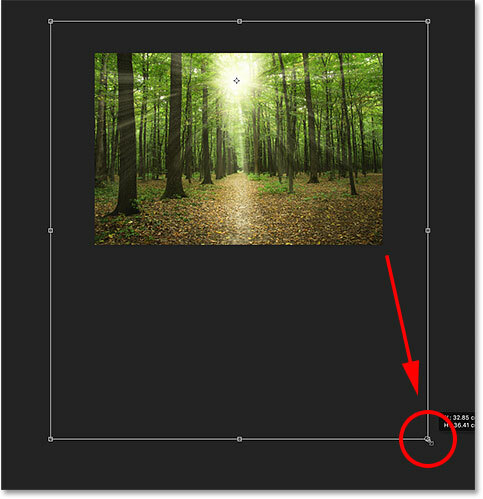 I'll be using Photoshop CC here but everything we'll be learning is fully compatible with Photoshop CS6. If you're using CS5 or earlier, you can still follow along here, or you can check out the original version of this tutorial. Every color we see in our image is made from some combination of three primary colors—red, green and blue—the primary colors of light. 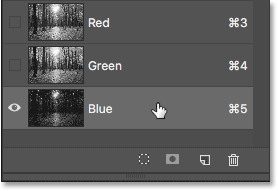 Photoshop represents these primary colors as color channels. There's a channel for red, a channel for green and, you guessed it, a channel for blue. Why are we talking about color channels? Well, we can use these color channels to help us create our rays of sunlight. Clicking on the tab to open the Channels panel. 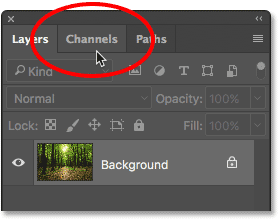 The Channels panel in Photoshop. 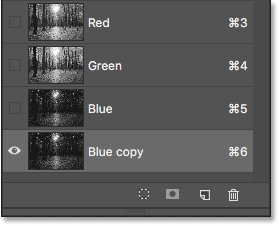 Even though color channels represent the three primary colors of light, if you look at the preview thumbnails to the left of the channel names, you'll notice that each one is actually a grayscale image. 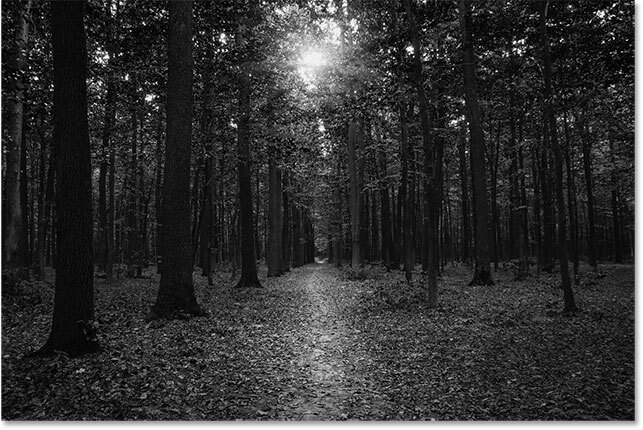 And, each grayscale image is different from the others. 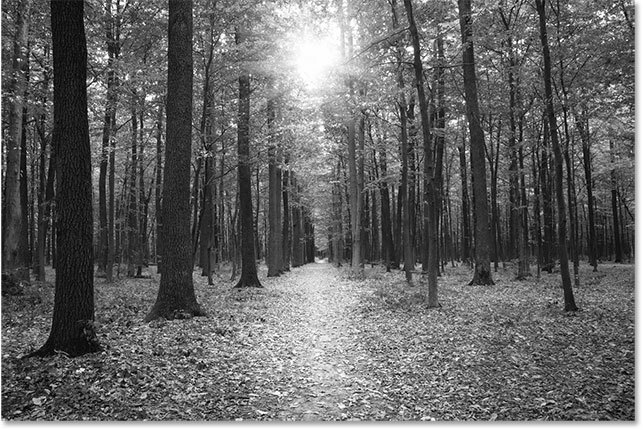 We're going to use one of these grayscale images to help us select the sky behind the trees. What we need to do first is find the one that gives us the highest level of contrast. Clicking on the Red channel to select it. The Red channel's grayscale image. 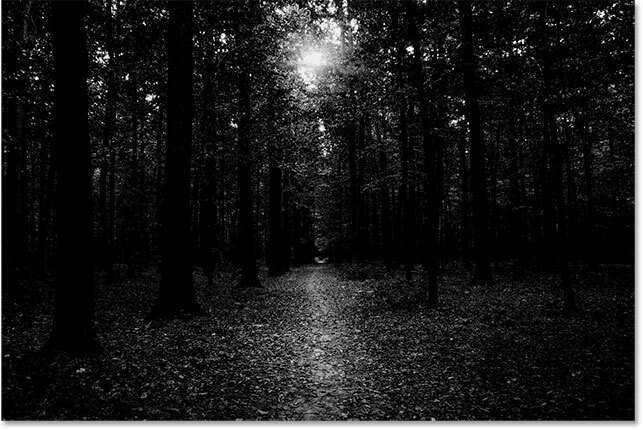 The Green channel's grayscale image. The Blue channel has the strongest contrast of the three. Copying the channel by dragging it onto the "New Channel" icon. A copy of the Blue channel appears below the original. This opens the Levels dialog box. 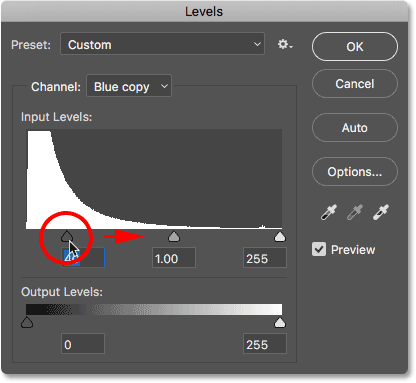 If you look directly below the histogram (the black graph that looks like a mountain range) in the center, you'll see three little sliders. There's a black one on the left, a white one on the right, and a gray one in the middle. You can ignore the white and gray sliders. The only one we need is the black one on the left. Dragging the black slider to push the dark areas to black. The result after applying the Levels adjustment. Even after darkening the image with the Levels adjustment, much of the ground in my image is still showing bright highlights. 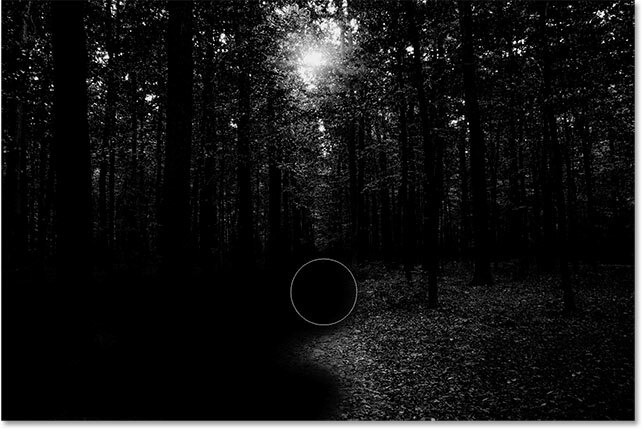 We need a way to darken the ground to pure black so that the only remaining bright areas are from the sky showing through the trees. Photoshop uses the current Foreground color as the brush color, so to paint with black, we'll need to set our Foreground color to black. 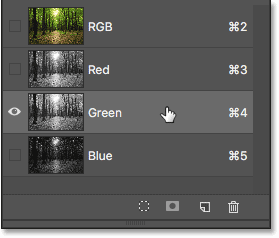 The fastest way to do that is by pressing the letter D on your keyboard to reset your Foreground and Background colors to their defaults. 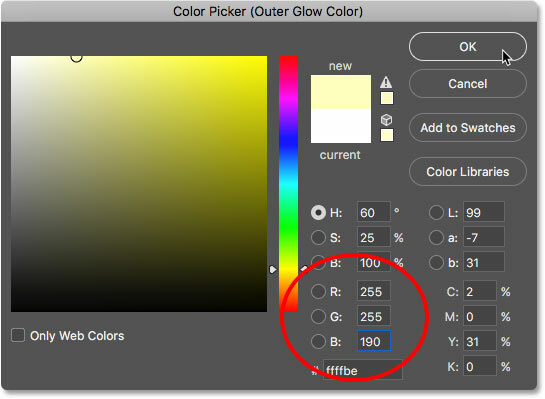 This will set your Foreground color to white and your Background color to black. 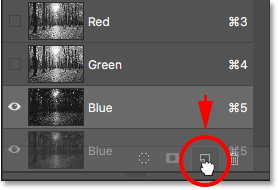 Then, press the letter X on your keyboard to swap them, making black your Foreground color. Setting the Foreground color (upper left swatch) to black. With the Brush Tool in hand, paint over the ground to fill it with black. 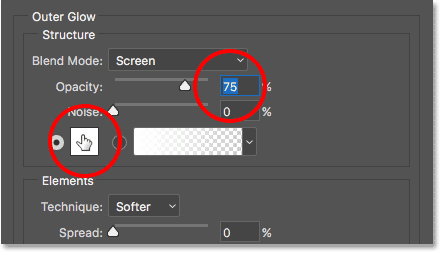 If you need to change your brush size, you can change it directly from the keyboard. Pressing the left bracket key ( [ ) repeatedly will make the brush smaller. Pressing the right bracket key ( ] ) repeatedly will make it larger. You can also adjust the hardness of the brush from the keyboard. Press and hold your Shift key while pressing the left bracket key to make the brush softer. Press and hold Shift while pressing the right bracket key to make the brush harder. Painting with black to cover the ground. The bright areas in the ground have been painted away. 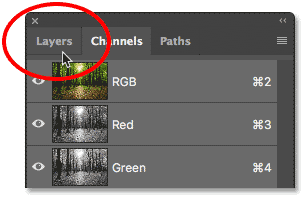 Clicking on the channel while holding Ctrl (Win) / Command (Mac). The bright areas are now selected. Clicking the RGB channel at the top. The selection outlines still appear after restoring the color. 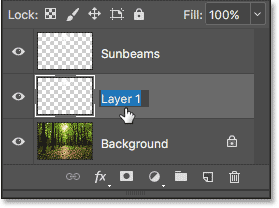 Clicking the Layers panel tab. 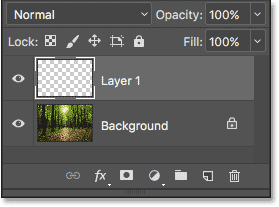 The Layers panel showing the new "Layer 1". The result after filling the selection with white. 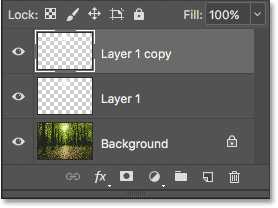 Dragging Layer 1 onto the New Layer icon. 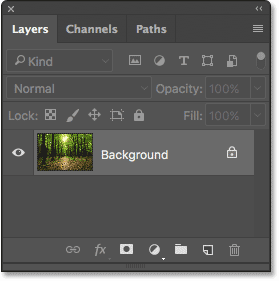 The Layers panel showing three layers now in the document. 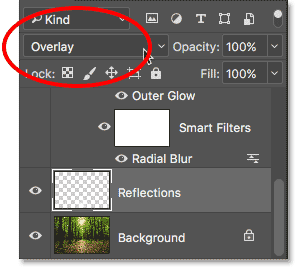 Double-clicking on the top layer's name. The "Layer 1 copy" layer has been renamed "Sunbeams". "Layer 1" is now the "Reflections" layer. 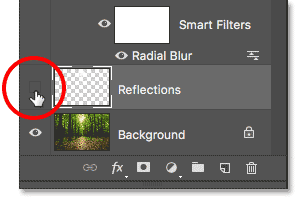 Clicking the visibility icon for the "Reflections" layer. 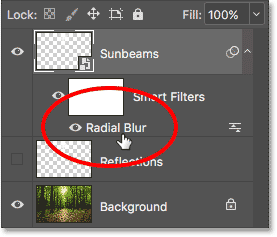 In a moment, we're going to create our sunbeams using Photoshop's Radial Blur filter. But the problem with the Radial Blur filter is that it can be tough to get things looking exactly right on the first try. 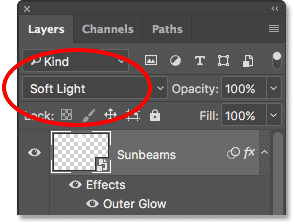 Right-clicking (Win) / Control-clicking (Mac) on the "Sunbeams" layer. 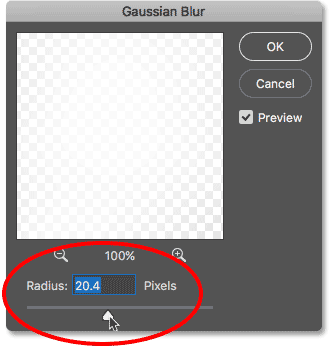 Setting Amount to 100, Blur Method to Zoom and Quality to Best. That part was easy. Now, here's the tricky part. 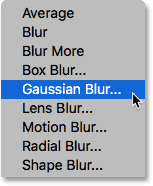 In the lower right corner, you'll find the Blur Center box. This is where we tell Photoshop where we want the sunbeams to start from. In other words, where the sun is located in the sky. Dragging the Blur Center spot into position. If you didn't get the center point for the sunbeams exactly right, don't worry. You can easily go back and edit your settings. 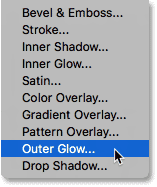 If we look below the "Sunbeams" layer in the Layers panel, we see the Radial Blur filter listed as a Smart Filter. 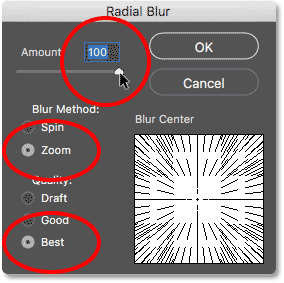 Double-click the Radial Blur Smart Filter to edit its settings. Changing the Outer Glow color to yellow. The effect after applying the Outer Glow. Step 20: Change The Layer Blend Mode To "Soft Light"
At this point, the sunbeams are a little too intense, so let's blend them in a bit more with the image. 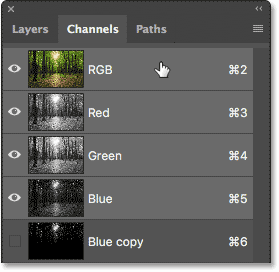 We can do that by changing the layer blend mode. To enhance the sunbeams even further, let's make a copy of our "Sunbeams" Smart Object. 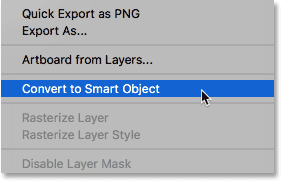 This time, rather than dragging the Smart Object down onto the New Layer icon at the bottom of the Layers panel, we'll use a handy shortcut. 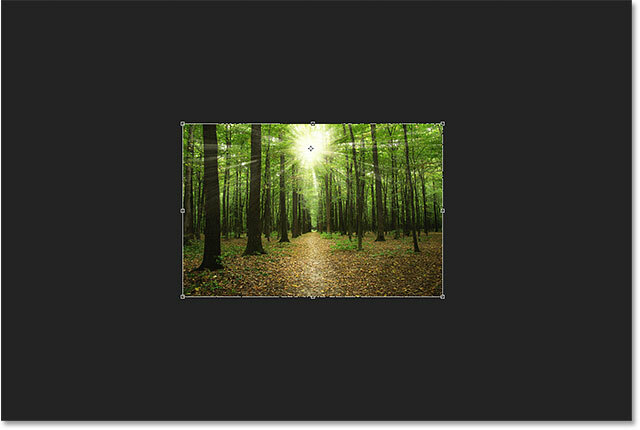 A copy of the "Sunbeams" Smart Object has been added above the original. 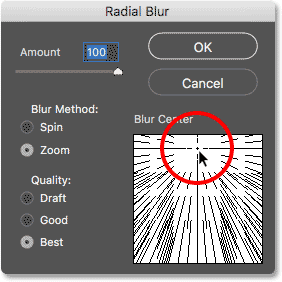 Notice also that the Radial Blur Smart Filter has been copied along with the Smart Object itself. We don't need to worry about changing our Radial Blur settings at this point, and in fact, the Smart Filter is just going to get in the way of our next step. 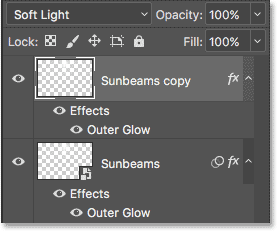 So let's simplify things by converting the "Sunbeams copy" Smart Object into a normal layer. Right-clicking (Win) / Control-clicking (Mac) on "Sunbeams copy". 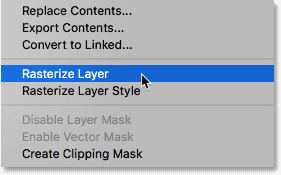 Choosing "Rasterize Layer" from the menu. 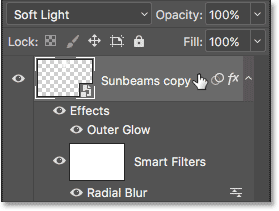 The “Sunbeams copy” Smart Object is now a normal layer. Step 23: Lengthen The Sunbeams With "Free Transform"
We now have two copies of our sunbeams; one on the "Sunbeams" Smart Object and one on the "Sunbeams copy" layer above it. 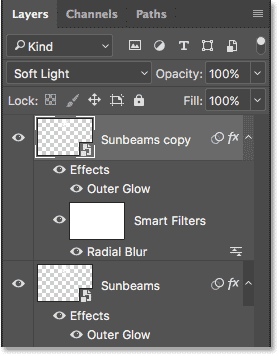 Let's make the sunbeams on the "Sunbeams copy" layer even longer to add some variety. We can do that using Photoshop's Free Transform command. This places the Free Transform box and handles around the image. If you look closely in the center of the Free Transform box, you'll see a little target icon. This target icon represents the center point of the transformation. Dragging the Free Transform target icon into the center of the sunbeams. 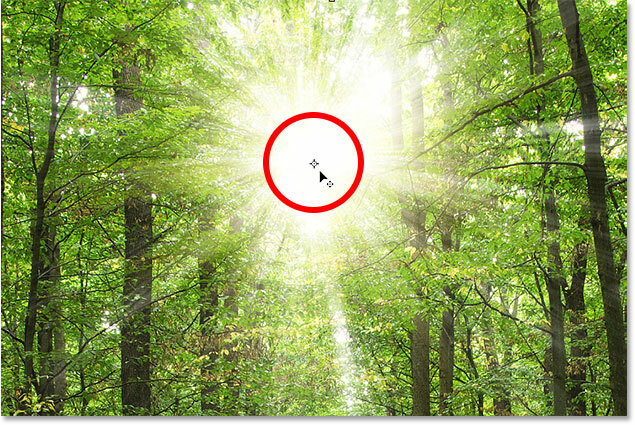 If you notice the sunbeams themselves moving along with you as you drag, you're dragging the layer, not the target icon. In that case, release your mouse button and press Ctrl+Z (Win) / Command+Z (Mac) to undo your step. 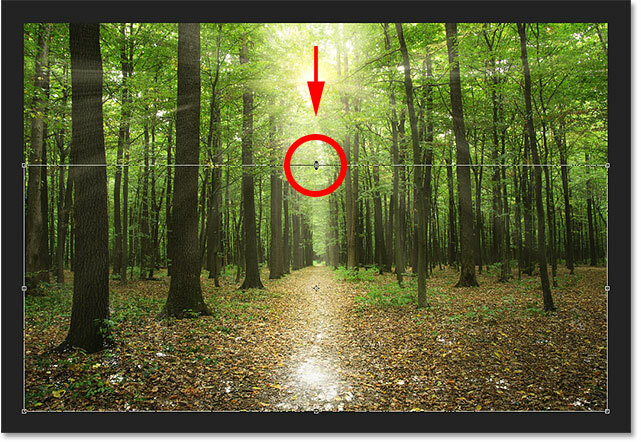 Then, try to click directly on the target icon itself and try again. Zoom out to give yourself more room to work. Then, press and hold the Alt (Win) / Option (Mac) key on your keyboard, click on any of the corner handles (the little squares) and drag outward to stretch the sunbeams. 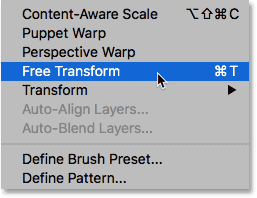 Holding Alt (Win) / Option (Mac) as you drag tells Photoshop to use the target symbol as the center of the transformation. Dragging out and downward to lengthen the sunbeams. When you're done, release your mouse button, then release the key(s). Make sure you release your mouse button first, then the key(s), or you'll get unexpected results. 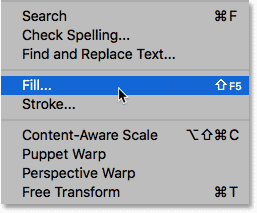 To accept the transformation and close out of Free Transform, press Enter (Win) / Return (Mac) on your keyboard. The effect after applying Free Transform. Dragging the Radius slider to blur the sunbeams. We're almost done. 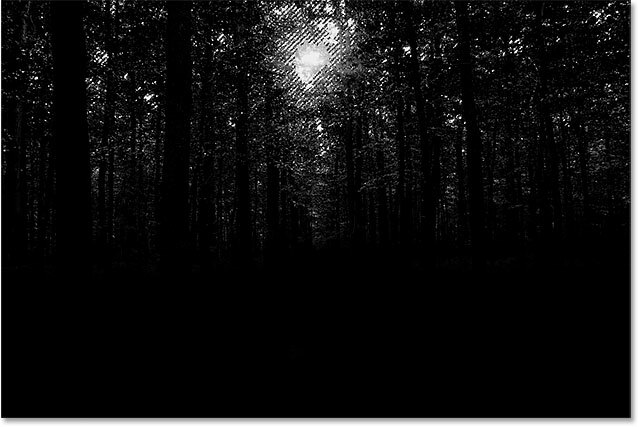 But one problem I have with my effect is that the sun is now looking so bright, instead of shining through the trees, it almost looks like it's in front of them. I want to keep my sunbeams at their current brightness, but I want to return the sun itself to its original brightness. 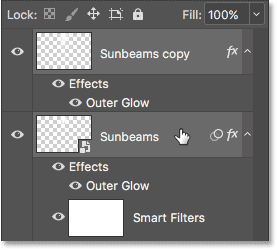 Selecting the "Sunbeams" Smart Object and the "Sunbeams copy" layer. 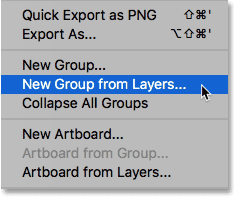 The "New Group from Layers" dialog box. 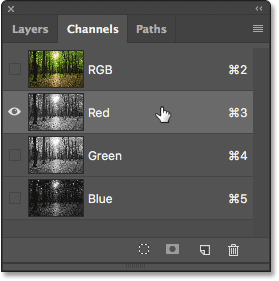 The Layers panel showing the new "Sunbeams" layer group. A mask thumbnail appears on the layer group. 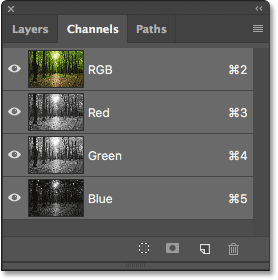 You can learn all about layer masks in our Understanding Photoshop Layer Masks tutorial. 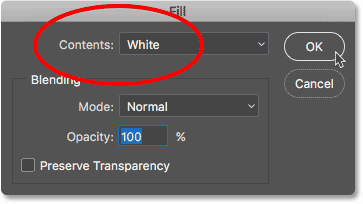 But in short, white areas on the mask represent areas where the contents of the layer group are fully visible in the document. Black areas represent parts where the contents of the group are hidden. At the moment, the entire mask is filled with white, so everything inside the group is visible. The Foreground color is set to black. Resizing the brush cursor and positioning it over the sun. The sun from the original image is now showing through the sunbeams effect. 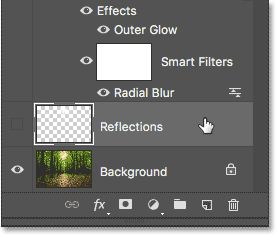 Clicking the "Reflections" layer visibility icon. 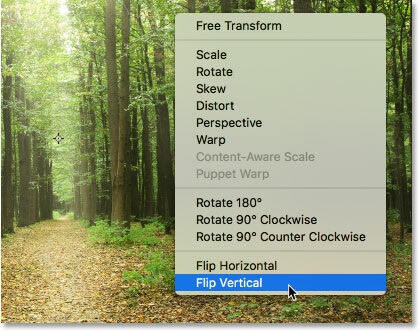 Right-clicking (Win) / Control-clicking (Mac) and choosing "Flip Vertical". The result after flipping the layer vertically. 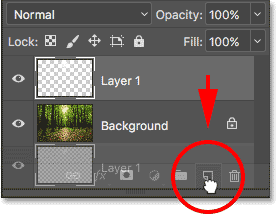 Holding Alt (Win) / Option (Mac) and clicking the Background layer's visibility icon. 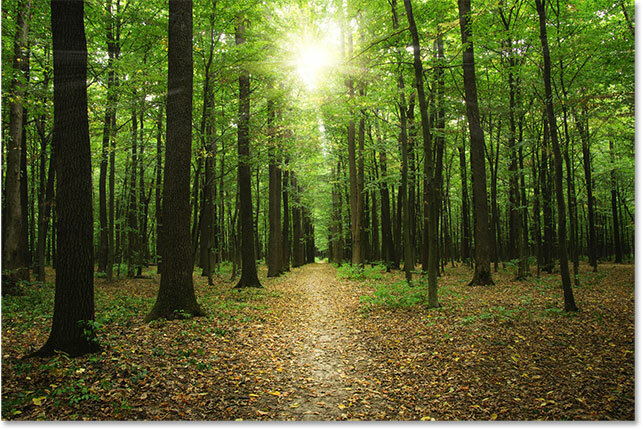 The final "sunlight through the trees" effect. And there we have it! That's how to create sunlight shining through trees with Photoshop! Looking for a similar tutorial? Learn how to add rays of light to a sunset with Photoshop. 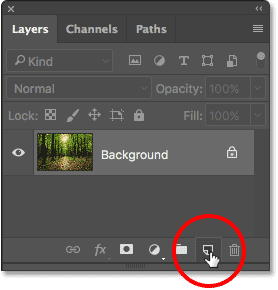 Or check out our Photo Effects section for more Photoshop effects tutorials!